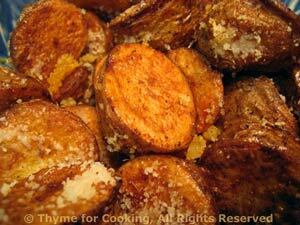 Roast Spicy Parmesan Potatoes, Thyme for Cooking side dish from the grill. Simple, grilled or roasted potatoes are perfect with equally simple, grilled meats. These have a light kick and are finished with a sprinkle of Parmesan cheese. Slice potatoes into thick rounds (1/2", 1cm). Put remaining ingredients, except Parmesan, into a large bowl and mix well. Put them into an old metal pie plate or cake tin or foil barbecue container (or whatever) that you will never use for any purpose but the barbecue again... and you should have one of these. Cook on barbecue (grill) for 25 - 30 minutes or until done. You will need to stir them with a long-handled wooden spoon occasionally as they tend to develop 'hot spots' and can get a little crispy. To finish: Remove and put into a bowl. Add Parmesan and stir to coat. Serve.